If you’re looking for the best wireless earbuds and you have small ear canals (or want to give earbuds as a present to someone with small ears), it can be not a simple task to find the right ones – primarily if you’re limited in time. Luckily for you, we have conducted research and will provide you with the list of the best wireless earbuds for small ears based both on the information we have found across the web and on our personal experience. If you’re in a hurry, we can say right away that in our opinion the Anker Soundcore Spirit Pro are the best wireless headphones for small ears that you can buy currently. Still, If you have 5-10 more minutes, then we suggest you to check out our full list and read the full reviews below. Anker Soundcore Spirit Pro are a great earbuds in terms of sound quality, fit, sweat/water resistance and playtime . This model is the updated version of previous Anker’s bestseller: SoundBuds Slim+. The Soundcore Spirit Pro comes with 3 sizes of ear tips and 3 different sizes of ear hooks. More than enough to choose from for the majority of people with all possible sizes of ear canals. The ear tips of Anker Soundcore provide great secure fit by themselves, but with ear hooks these earbuds become excellent for any sports and outdoor activities. Battery lifetime increased to 10 hours of listening comparing to 7 hours in SoundBuds Slim+. Soundcore Spirit Pro have IP68 water-resistant standard and their sweatproof SweatGuard technology so that they can be safely used in various conditions such as sweat during intensive training or raindrops. As well as Mpow, Anker gives their customers 18-month warranty on Soundcore and customer support. These are nice wireless earbuds with an affordable price that can easily compete with more expensive models. And, by the way, Spirit Pro earbuds also have magnets for putting buds together to wear them around the neck while not in use. 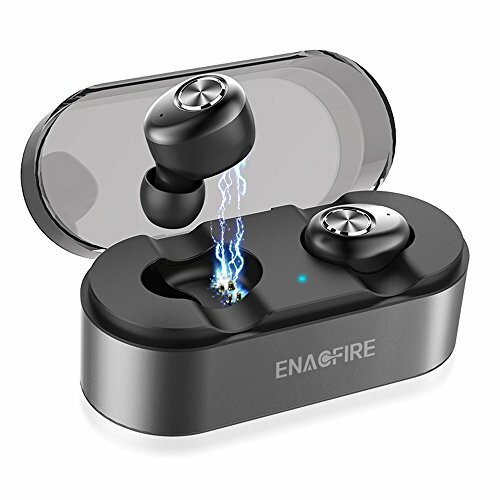 EnacFire E18 are wireless earbuds with superior sound quality reproduction and will bring the most comfort for any type of ear. Unlike the conventional earbuds with annoying pairing, these connect with one-step pairing technology. It means that you can readily connect as long as they are on. They are contrary to the traditional ones that need clicks on the power button for connection. It will only take you a few seconds for you to start enjoying your music with these earbuds. The best part about these earbuds is the multiple using modes they come with. These modes provide listening satisfaction at different levels and moods. When you are home relaxing and unwinding, the stereo mode will bring you the much needed satisfactory with the premium HD sound. Also, when you want your family or spouse to listen to a great jam, there is a share mode for that experience. The single mode allows you to listen to your music as well as the sound in your surroundings. These earbuds offer circa four hours of music playtime on a single charge. The charging case has power that last up to 15 hours for uninterrupted listening experience on the go. This supplements the less hours given for music playtime. There is a built-in microphone to pick calls conveniently. The anti-drop design of these earbuds make them suitable for small ears even when engaging in movement activities. Beats is a brand known for providing accurate sound with great clarity in every detail. With the BeatsX earphones you will immerse in your music as they have maximum noise cancellation for a great experience. They feature a state-of-the-art acoustic design that conveys clear treble and deep bass with no distortion. This allows you to listen to a wide range of music genres. BeatsX earphones have a distinctive Flex-Form cable that fits comfortably in the ear. This cable has adjustable fitting options making the earphones suitable for all types of ears. The design is comfortable enough for an all-day listening experience without causing fatigue to the ear. They are lightweight and compact not to mention the sleek design they exhibit. There is an Apple W1 chip incorporated in the Beats earphones that changes the way you connect to your devices. This technology allows for effortless connection even while switching to your Apple devices. The chip provides an 8-hour battery life perfect for when on the go. Featuring the fast fuel, you will get two hours of playback on low battery with a 5-minute charge. With these earphones, you can receive and reject calls, control your music as well as activating Siri with remote talk. 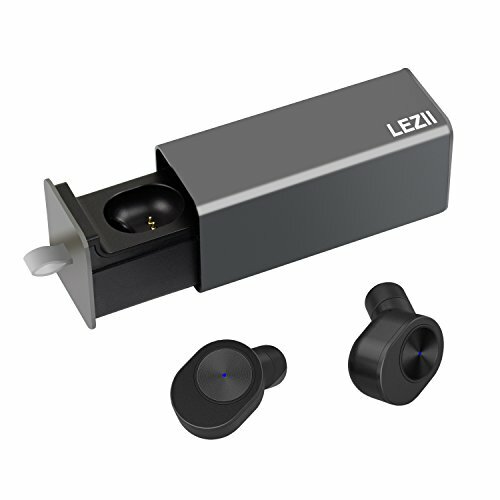 If you are tired of earphones falling off every time you engage in strenuous activities, then these Lezii GW10 wireless headphones are for you. They feature the latest v4.2 Bluetooth technology for faster connection and with minimal delays. This enables you to enjoy your favorite jams with reduced destructions. 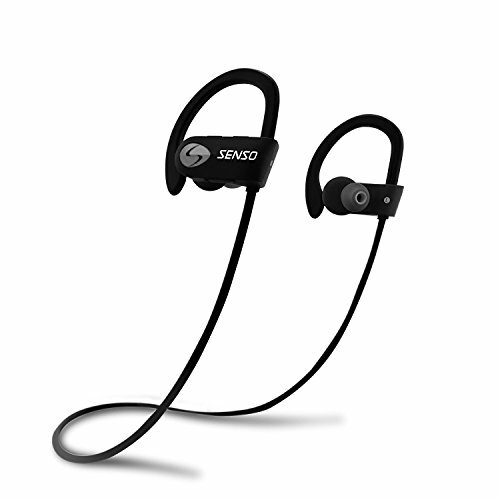 These earphones use the true wireless technique which completely eliminates the use of cables for easy walks and jogs. Each earbud is designed to be used as a Bluetooth headphone, all on its own for a divergent listening experience. When it comes to fitting in the ear, these in-ear headphones are perfect for different ear types. This is because they use a soft and sweat proof material on the earbuds to protects the ear. The ear hooks have a comfortable design that doesn’t fall off when exercising, running or even sleeping. These earphones feature multiple connection function which allow you to select between the single-mode and twin-mode. Single mode allows you to pair each earbud with a different handset whereas twin mode enables sharing audio with a friend. There is also a microphone for receiving calls as well as activating Siri. The earphones come with a storage case with charging function for great convenience on the move. This case has a battery capacity of 450mAh and is rechargeable via USB. To charge, simply place them in the case and the red pilot light will light up to indicate they are charging. Sports enthusiasts can attest to how annoying it gets when their earbuds keep falling off when they are exercising. Senso headphones are the best for these situations as they provide perfect fit for every ear. It’s achieved thanks to the adjustable ear hooks that ensure a comfortable fit for different types of ears. The ear hooks have gel flex silicone earbuds for a firm and fatigue-free fit. Waiting for wireless headsets to connect can be a daunting task. As a result, the Senso provides a suitable solution by connecting smoothly up to 30 feet away from the devices. They combine the Bluetooth V4.1 wireless with CVC 6.0 noise cancellation technologies, and allow you to fully enjoy every bit of your music. You will like inconceivable sound reproduction with strong bass and clear detail. 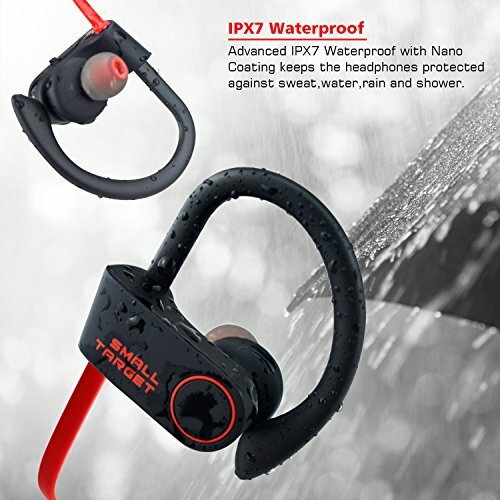 The earphones have a durable design with IPX-7 waterproof rating to prevent sweat from causing any damages to them. Featuring the advanced lithium polymer battery, you are able to enjoy your music for up to 8 hours. They have the longest lasting battery compared to other earphones in the same category. When on standby mode, you get up to 240 hours and they take 1.5 hours to achieve full charge. 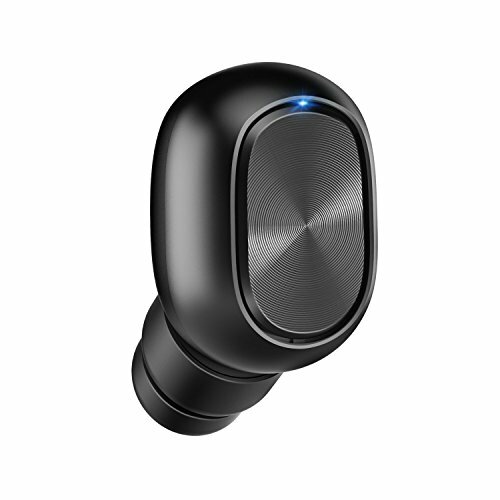 If you are looking for truly wireless earbuds primarily for calls, then ZNT Fit model is worth to look at. These are entirely cordless in-ear headphones with up to 6.5 hours of music playing, up to 8 hours of talking and it only takes 0.5-1.5 hours for full charge. ZNT Fit comes with ear tips of 3 different sizes. The ear tips are made of soft rubber and provide a secure fit for more comfortable and safe usage. After all, secure fit is probably one of the most critical factors for truly wireless earbuds, because if they fall out of ears, there is just nothing to prevent them from hitting the ground and possible damage. There are two magnetic chargers with USB connector in the package – this may be pretty convenient because, for example, you can keep one of them at home and the second one in your car. Important note: there is only one earbud in the package. So make sure to order 2 items if you need the full set of earbuds. The sound that the ZNT FIT earbuds deliver is close to crisp and pretty clean, but it’s not too loud. So if you’re a lover of listening to the music very loudly, then these headphones are probably not your choice. But if you need some earbuds without any wires at all that deliver solid sound quality while talking and music playing with an average volume – these ZNT set might be a winner for you. Affordable sports earbuds with the IPX7 waterproof rating and 9 hours of working time – that alone sounds pretty cool, right? Let’s add the AptX codec here for better sound quality and one year manufacturer’s warranty, and you get one of the best options between all the existing wireless earbuds. As you can see in the photo, these earbuds have ear hooks that adjust over the back of the ears for more secure fit (indeed for sports). They also have wire clamp for its length adjustment. The earbuds are perfect for exercising, working out, cleaning the house, hiking or any other activities that involve movements. With the battery that delivers up to 9 hours of play time, you can easily take these earbuds on a day trek or a long bike ride. You can connect the Small Target to two Bluetooth devices at the same time. Thus you can pair the earbuds with some HD player and with your phone simultaneously so you won’t miss a call while listening high-quality music. In open space the operating distance is up to 33ft – this is enough for comfortable listening while cleaning the house and keeping the smartphone in one place (of course, you may need to carry it from time to time). The earbuds have 3 different sizes of ear tips in the package so that they will hold securely in the ear canals – including small ones. 1) they have 3 sets of ear tips versus 5 sets of TGH earbuds. Even though it’s not crucial in most cases, while choosing the best earbuds specifically for small ear canals, it’s essential that earbuds have as much ear tips of different sizes as possible. Because “small” is a relative concept and two people with (relatively) small ear canals may still need two different sizes of ear tips to have the best experience. 2) The design of TGH earbuds is better than Small Target, even though it’s always a subjective point without a doubt. Overall, the Small Target are fantastic wireless earphones and, considering its low price, you probably cannot go wrong with them. 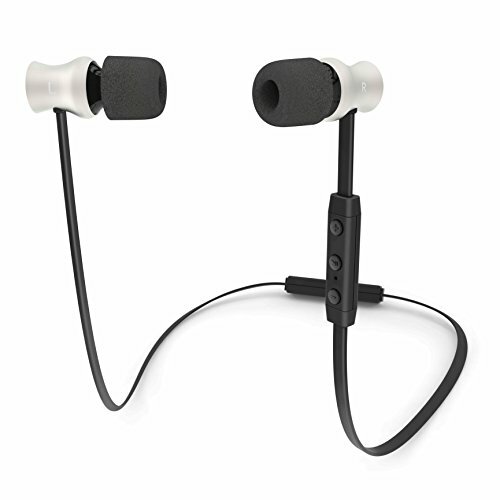 These earbuds come with 3 ear tip sizes out of the box – nothing special here, but the tips provide stable and secure sealing, and the biggest tips can be used for noise-cancelling purposes. The Mpow Cheetah has an interesting behind-ear design with ear hooks and resilient wire that’s automatically rolled up for carrying in pocket or bag without entanglement. This wire also snugs against the neck or your head giving comfortable and safe wearing. All of these design features make Mpow Cheetah great earbuds for jogging, running, biking, workouts and any other outdoor activities. The battery provides up to 8 hours of playing time, which is always good for people who don’t like or not able to recharge the device frequently. Earbuds work with Bluetooth 4.1 technology and also powered by AptX codec that additionally increases sound quality. As for the warranty, Mpow provides an 18-month guarantee, and that is incredible for any wireless earbuds. These earbuds are very comfortable, lightweight and deliver excellent sound quality. They are powered by 10mm speakers – these are one of the biggest speakers on the market used in wireless earbuds of similar sizes. This helps the TGH earbuds to provide deeper bass and cleaner sound on mids and highs as well. The earbuds have the magnetic clasp which allows securing buds around your neck during a break in listening. This model also has the built-in microphone, so you don’t have to get your phone out of the pocket to answer a call. The battery in TGH Wireless Headphones allows up to 5 hours of listening while it takes only about 1.5 hours for a full charge. It also has a 15-min quick charge option so that even when you have very little time for charging you will still get one or a few hours of wireless sound. The headphones come with 5 set of ear tips: 1 set of Comply Foam tips and 4 sets of silicon tips. Of course, their sizes are different and, in addition to all the other advantages, that’s what makes these earbuds best for people with small ear canals. To summarise, in our opinion the TGH Wireless Headphones are great Bluetooth earbuds with a reasonable price, high-quality sound and substantial battery lifetime. And the presence of 5 sets of ear tips in the package makes these headphones the best for a person with small ears. If you are looking for the utmost music experience, then you might think of investing in the Jabra Elite sport earbuds. These earbuds offer the most premium sound quality and comfort on every use. Each earbud features two microphones which work at minimizing destruction for perfect listening experience. The call controls enable you to receive calls, end them or reject them. You can play, pause, track forward and backward with the intuitive music controls. They use the Bluetooth 4.1 technology to ensure effortless connectivity to other devices and provide a comfortable and secure fit every time. This is because they have flexible fitting options designed for different types of ears and enable all-day use without fatigue. These are the best earphones for sports as you have an option to either wear one or both earbuds. Featuring an IP67 waterproof rating design, sweat and moisture will not damage them. Jabra Elite Sport have up to 9 hours of battery power for all-day listening enjoyment. You get 3 hours in the earbuds and when placed in the charging case, you will have the extra 6 hours. 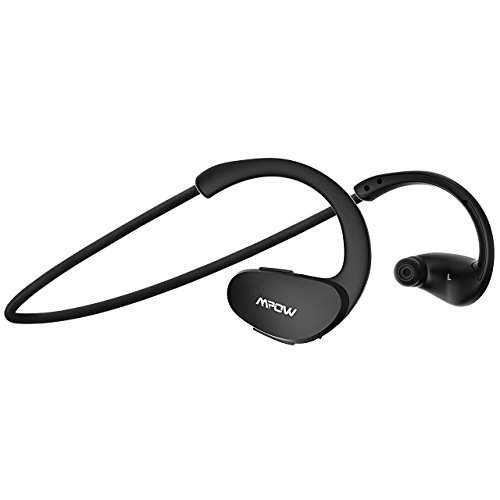 As mentioned earlier, these are the best earbuds for sports as they feature advanced heart rate monitor and TrackFit motion counting sensor. Your phone will display the calories burned, training effect, average heart rate and speed via a dedicated App. The tracking controls allow you to open the Jabra sport app on your phone, start or stop the workout and receive real time coaching feedback. We’ve also written a buying guide for choosing cordless earphones in our Best Wireless Earbuds article, so you may want to check that out as well. First of all, let’s find out what are the main advantages and disadvantages of wireless/Bluetooth earbuds in comparison with the standard wired headphones. The strongest advantage of all the wireless headphones is the freedom in movement while listening. No matter what you do – running, riding a bicycle, walking, riding a scooter, mountaineering/climbing, working out, exercising at the gym, moving in public transport or just cleaning the house – you will feel the comfort of the absence of cables. And in some activities and sports (like swimming) it’s almost impossible to use regular wired headphones at all, so switching to wireless can be the only way out for some people in some situations. Many wireless earbuds also allow controlling audio directly from the headphones, without a need to reach a phone or other audio source. Sure, some wired earphones have a remote control on its cord as well, so it’s not always an advantage and still depends on specific models. One of the most significant (and understandable) downsides of wireless headphones is that it requires charging. Again, this depends on specific people and their lifestyles. For someone who only needs earbuds for a few hours a day it won’t be an issue at all. But for another person who, for example, loves long hikes – having one more device that needs charging can be an additional headache. This disadvantage is however continually weakened with the development of technology and increasing the battery capacity. There are already models that provide 12+ hours of wireless play time. And battery’s lifetime will only improve with time due to new technologies (in particular also due to the popularity and the development of electric vehicles and their batteries). Even though this downside is also gradually eroding, the price of wireless earbuds usually higher than standard wired earphones with similar audio quality. Of course, there is nothing strange here because, except for the speakers themselves, all wireless headphones have at least Bluetooth/Wi-Fi module and a battery on board. And most of the wireless devices also use some extra modules and technologies (e.g. AptX) that cost a penny as well. However, thanks to amazing manufacturers from China (and not only), there are enough models currently with excellent sound quality (comparable with wired headphones) in various price categories. Unfortunately, there are no comprehensive studies on this subject yet and usually only a few mention radio waves as shortcomings of all wireless devices (including wireless earbuds). However, based on my research, I’m almost sure that any headphones (and any other devices) that work via Bluetooth or Wi-Fi technology harm our body. The magnitude of the harm is a task for professional research in this field, but the fact of the harmful effects itself is beyond any doubt for me. Personally, while understanding the risk of using wireless earbuds, I do own and use them, but from time to time only. I also have conventional wired earbuds and try to use them most of the time. So, my honest personal advice for anyone who wants to buy wireless headphones is to use them only in situations when a wired option is not suitable – e.g. while running, working out and so on. Sure, I could be wrong with it and, probably, radio waves don’t harm our health at all. But, as they say: it’s better to be safe than sorry. Yes, due to the limits of wireless technologies wired headphones generally have cleaner sounding. With the technological progress, the differences are getting smaller and smaller though. So, for most people, the sound quality of good wireless earbuds is more than enough for daily needs. However, if you are a true audiophile and catch every note and tone of all sounds – most likely you will need wired headphones to satisfy your music lover nature completely. 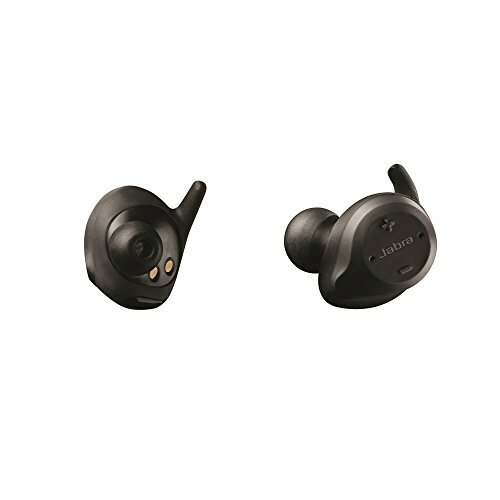 If you have ears with small ear canals (or you’re looking for a gift for someone who has small ears), there is only one general thing you have to take care about when choosing the best wireless earphones – it’s the availability of interchangeable tips with different sizes in earbuds package. We made sure that all the wireless headphones mentioned in this article do have various ear tips, so any person with small ear canals can comfortably use any of the models mentioned above. When buying wireless earphones, you should always check whether they will fit in your ears. How the earbuds fit determine the comfort and sound quality you get. Getting the right size for small ears can be tricky. That is due to the fact that people have ear canals with different shapes and forms. For this reason, you should pay attention to the size of the eartips if you want a comfortable fit. When your earphones keep falling off while engaging in different activities, they become a nuisance. Eartips that are too small don’t work well to form a strong seal for sound isolation. This means that the sound you get will be of low quality with minimum noise cancellation. However, if you are buying the earphones for small ears, they will provide perfect fit with no discomfort. Larger eartips have similar effect as they can cause utmost discomfort and can easily slip out of the ear. Wireless earphones offering multiple sizes of ear tips are the best options since you can get the right size for your ears. You are able to try all of the eartips to ensure you get the right one offering comfort and secure fit as well as good sound quality. Small ear tips have a deeper fit that produce the best sound results. Larger ear tips on small ears will sit at the threshold of the canal and may provide comfort when partaking lighter activities like sleeping. The right size of eartips will keep the earbuds strongly inserted in your ear. Also, most sport earbuds have ear fins to hold them shallowly in the ears. There are two main ear tips for in-ear headphones (both wireless and wired models) currently: it’s silicon ear tips and foam ones. Each of them has its pros and cons, however, two different people can have opposed opinions on each of them. First of all, let’s clarify what Comply Foam tips are. Comply is a registered trademark of Hearing Components, Inc. In short, the story of this brand started in 1990 when a former employee of the 3M company Robert Oliveira (PhD) allocated the Comply brand to a separate company. Since that time Hearing Components Inc. has been creating a wide range of product for hearing with a speciality in foam formulation. The Comply Foam ear tips use memory foam technology which allows them to adjust to the shape of the ear canal while exercising, running or working out (due to temperature changes and movement). This also leads to a richer bass and better sound experience overall. You can read about all the benefits of Comply Foam on their official website. At first glance, this may look like something too obvious to write about, but Comply Foam tips have to be inserted a bit differently than regular silicon ear tips. First, you need to roll/squeeze the tip into a thin cylinder. Then gently insert the entire tip into the canal and hold it in for 10-15 seconds. During this period the foam will expand and take the shape of your ear canals, and you will be ready to explore all the benefits of Comply foam tips with great isolation. Of course, besides the correct inserting, you will likely need to test out different sizes of tips to choose the one that suits you best. Should I choose only between earbuds that come with Comply Foam ear tips? First of all, if you pick quality wireless earbuds most likely even silicone ear tips will provide robust sealing and sound delivery. And secondly, you can always buy Comply Foam tips additionally if you feel that standard silicon ones don’t satisfy your needs. So you should always consider and compare earbuds and their filling (like battery capacity, Bluetooth module, sound quality, etc.) first while also making sure that there are ear tips of different sizes inside the package. In other words, foam tips are not able to transform some poor headphones into good ones. But they can really enhance advantages of quality earbuds and help to move your sound experience to the next level. What about the Apple airpods? Any good? Thanks for your question and for stopping by, Kim! Apple Airpods is not the best option for people with small ear canals simply because you can’t choose between different sizes of ear tips (since they are made in one-piece body). So they can cause inconvenience (or even pain) by putting pressure on ear canal. Another reason why I personally don’t recommend them is the price. Simply compare it with the Anker Soundcore Spirit Pro – you can get them for apprx. 1/3 of the Airpod’s price. And with Anker you’re getting 3 different sizes of eartips and up to 10 hours of playtime vs 5 hours in Airpods. 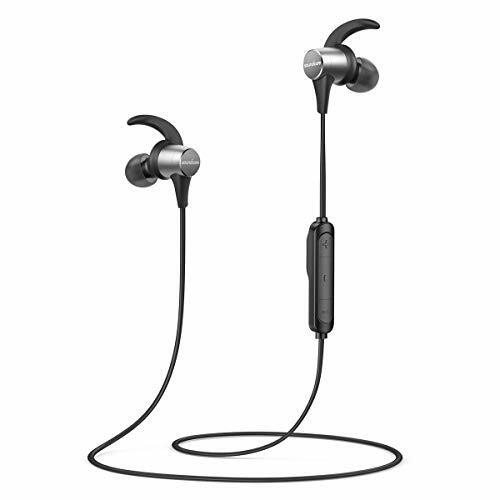 And if you need truly wireless earbuds and the price is not an issue, then I’d recommend to take a look at Jabra Elite Active 65t. They’re a bit more expensive than Airpods, but again they come with 3 different ear tips and the sound quality is better than in Airpods. Thanks for a great article – am looking for my wife who has very small ear canals – tired of going on line and ordering to find they still do not fit – is there a store that would allow to test size? we are in the Toronto/Barrie area. Hi David – also need to mention she has a FItbit Versa and swims – would like to load music on her watch and then listen while working out and swimming. Hi John! Thanks for stopping by and for your comment. I understand that some ear canals are so small that it’s really difficult to pick the model with a suitable ear tips. But, just curious – did your wife try Anker Soundcore Spirit Pro? P.S. With Fitbit Versa any earbuds should work fine as long as they are Bluetooth.